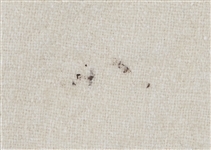 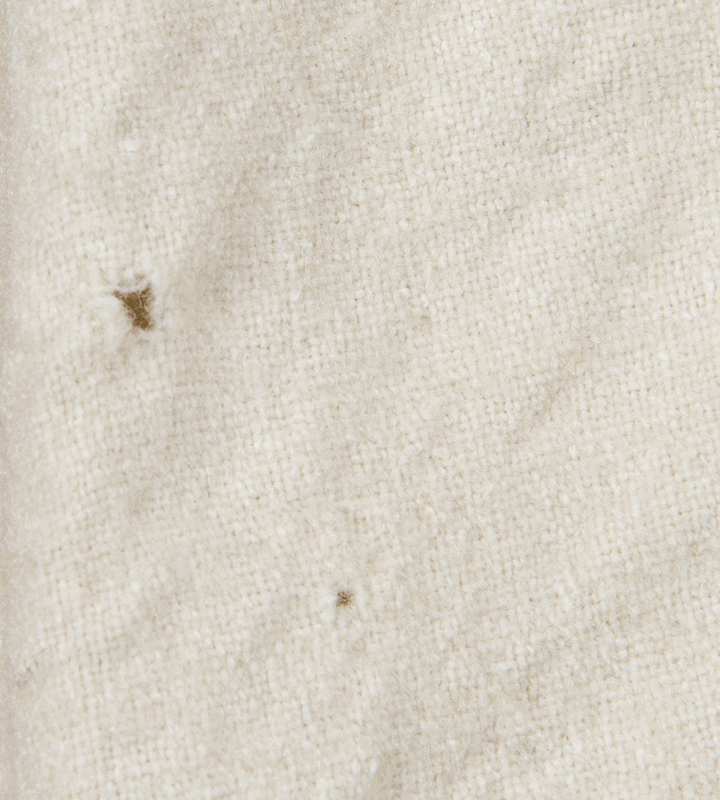 It’s a special event when an item that is museum-worthy item to comes up for auction. 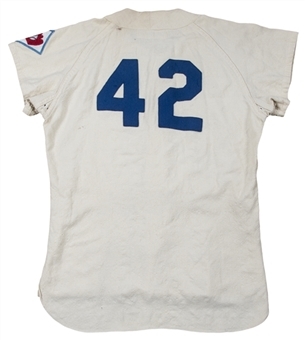 Which is exactly what we have here as Goldin Auctions is proud to offer this incredible 1951 Brooklyn Dodgers flannel home jersey that was worn by one of the most historic players of all-time – Hall of Famer Jackie Roosevelt Robinson. 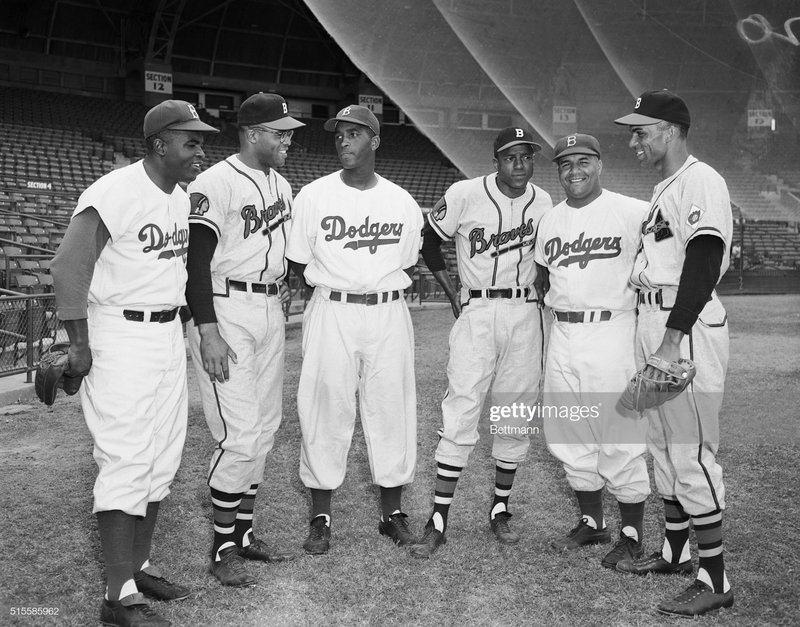 Robinson, only four years prior, broke baseball's color barrier becoming the first African-American to play in the Major League. Jackie Robinson’s signing by the Montreal Royals and then the Brooklyn Dodgers ushered in not only baseball’s most competitive era, but were the first two salvos in the fight for African-American’s Civil Rights. Because of Jackie Robinson's historical place in baseball, his game used jerseys are the pinnacle of the collection hobby which makes them the most desirable to obtain. 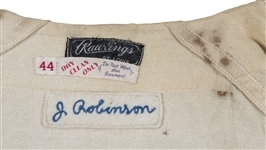 Only a handful of Robinson jerseys have ever been sold at auction, which shows how rare and difficult they are to find. 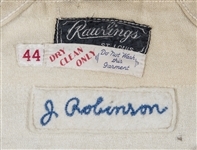 This offered jersey is one of those rarities and Robinson wore this very cream-colored flannel beauty during the 1951 season - a memorable season for New York's National League teams the Giants and Dodgers, who staged an epic duel to close out the regular season for the right to go to the World Series as National League champions. 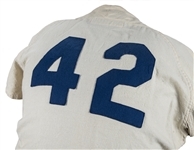 1951 was an excellent season for Jackie, as he had his second-highest career batting average of .338, which only trailed Hall of Famers Stan Musial and Richie Ashburn at seasons end. 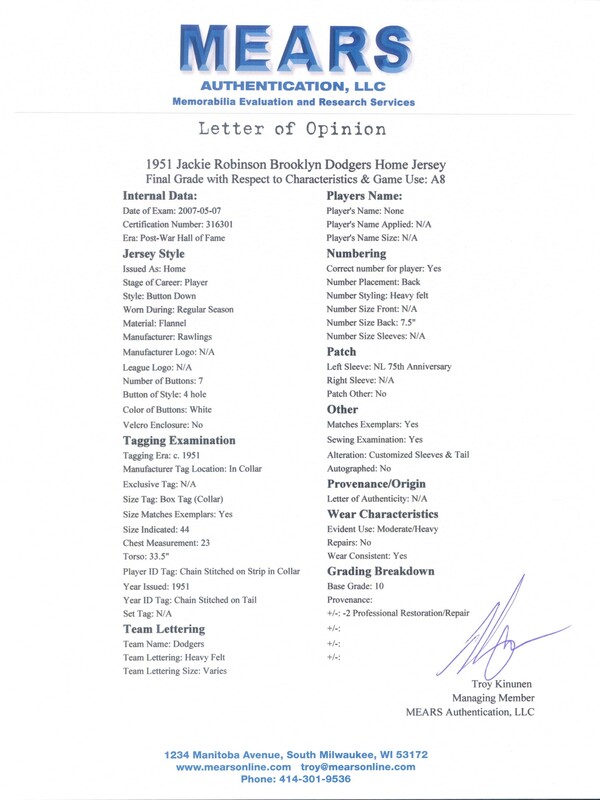 Robinson also had solid power numbers that included 19 home runs and 88 RBI as he helped the Brooklyn Dodgers to a 97-60 record. 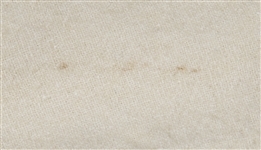 The Dodgers and Giants both finished with a 96-58 record, which forced a best-of-three series to decide the National League pennant and was ultimately won on the Giants’ Bobby Thomson’s famous “Shot Heard Round The World” walk-off home run in the deciding third game. 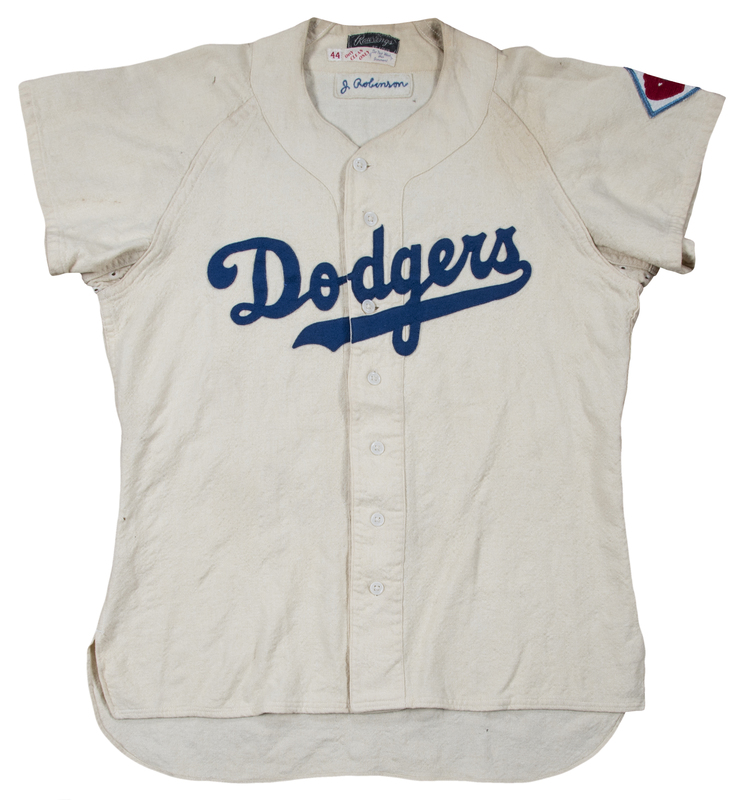 The front of this magnificent button-down jersey has "DODGERS" and a paraph sewn on in blue felt across the chest. 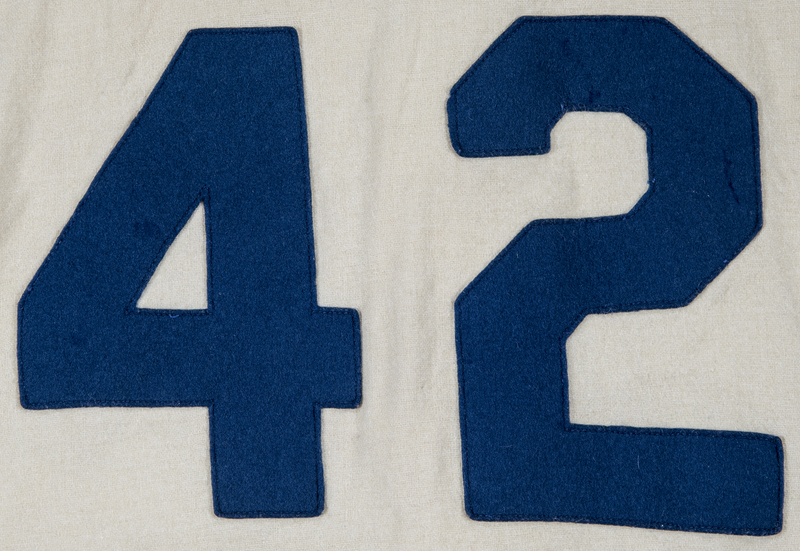 The back of this jersey has Robinson’s league-wide retired number "42" sewn on in the same blue felt. 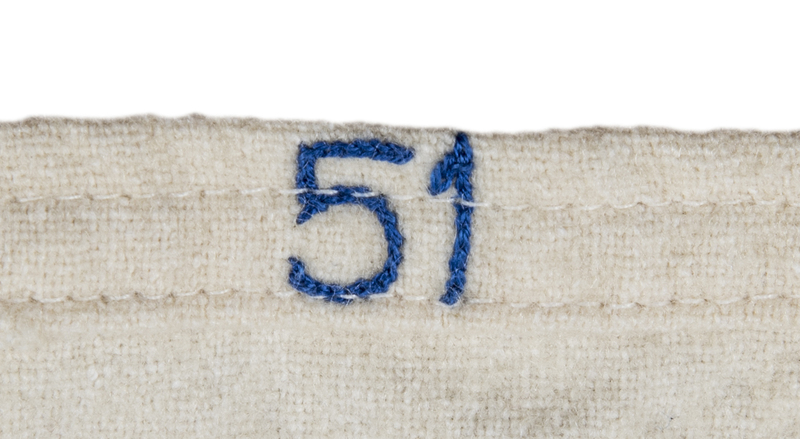 The inside bottom left tail has the year "51" sewn in blue chain stitching directly in the jersey. 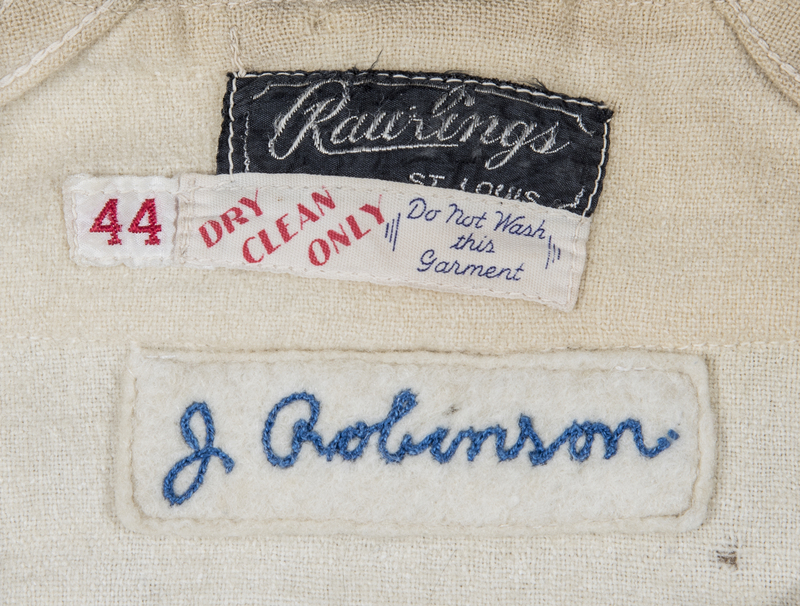 On the inside of the collar is the "Rawlings St. Louis" manufacturer's tag with the wash instructions tag and the size 44 tag attached below. 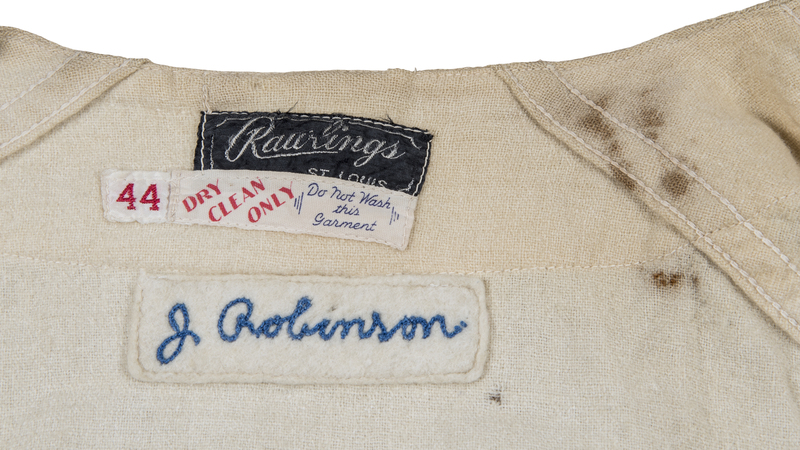 Beneath the tagging is a felt strip tag with "J Robinson" in blue chain stitch, identifying this jersey to Jackie. 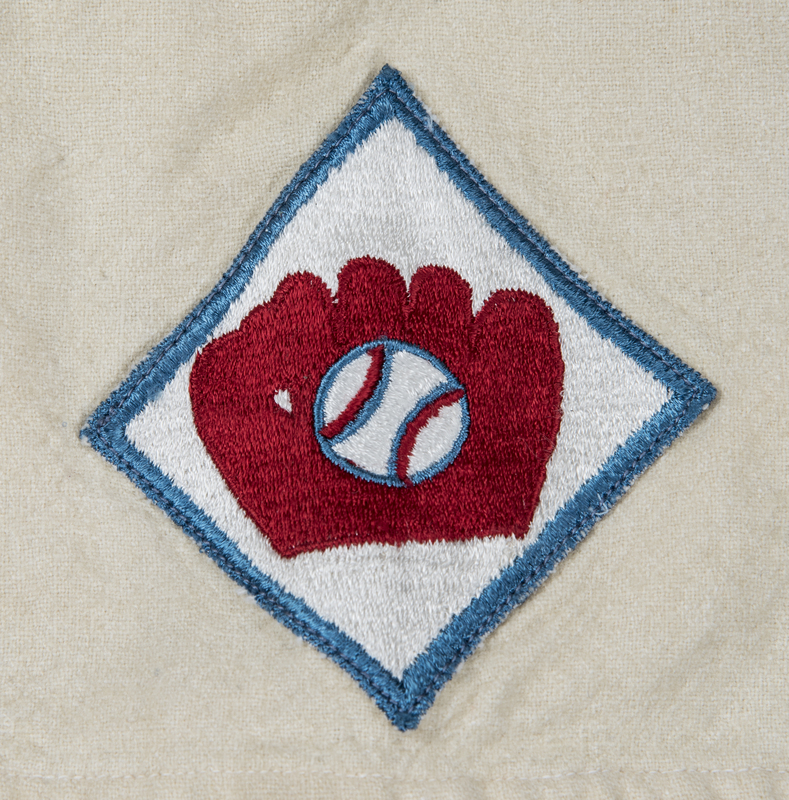 The left sleeve has an original "National League Anniversary" patch, which has been professionally re-added to this jersey with precision and accuracy. 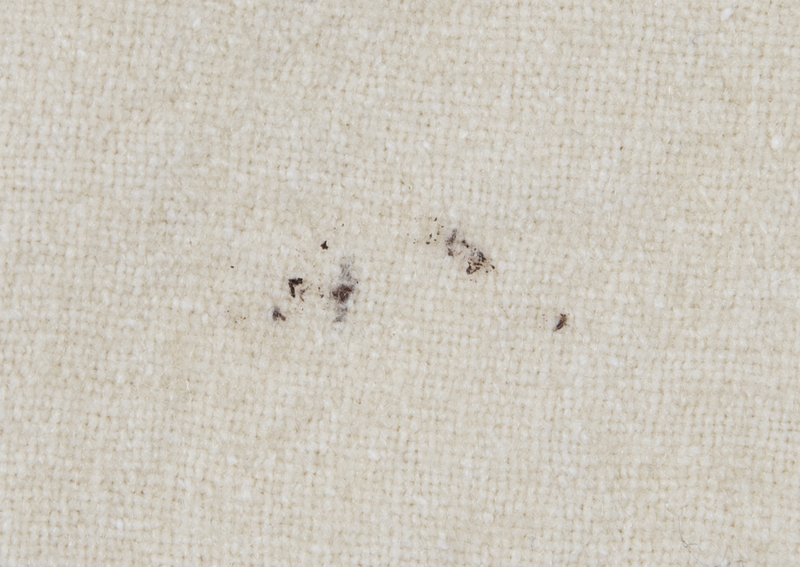 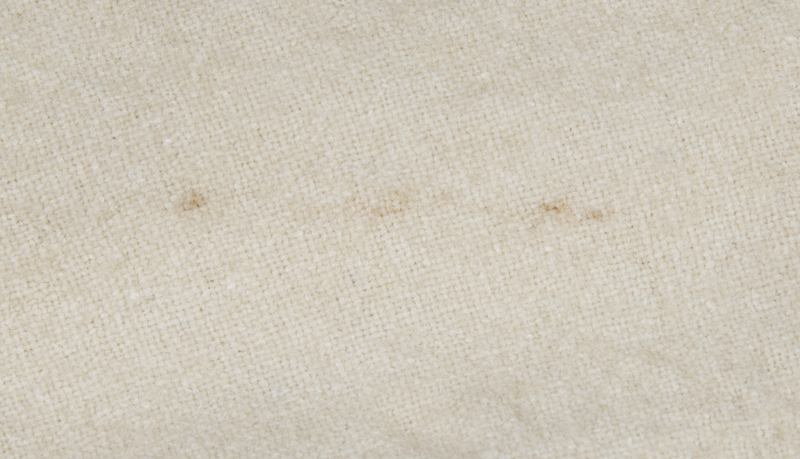 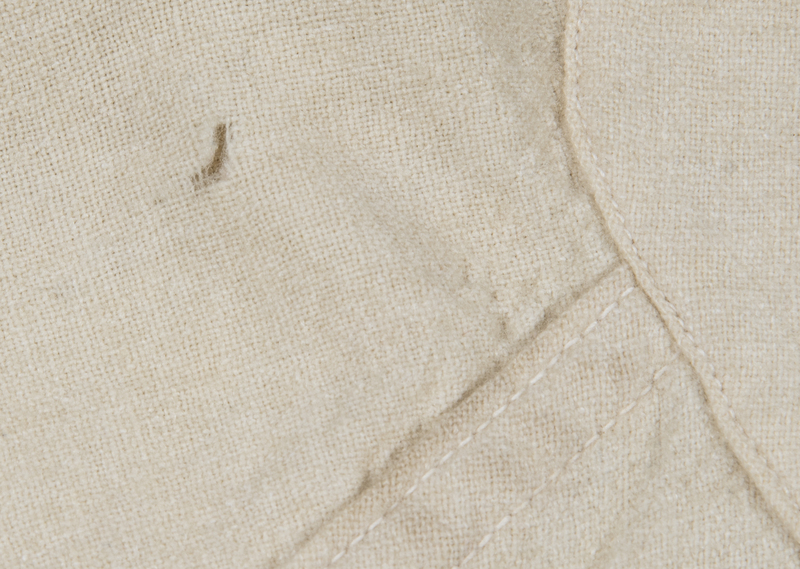 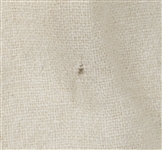 Both the sleeves and the tail of the jersey have been professionally shortened and hemmed. 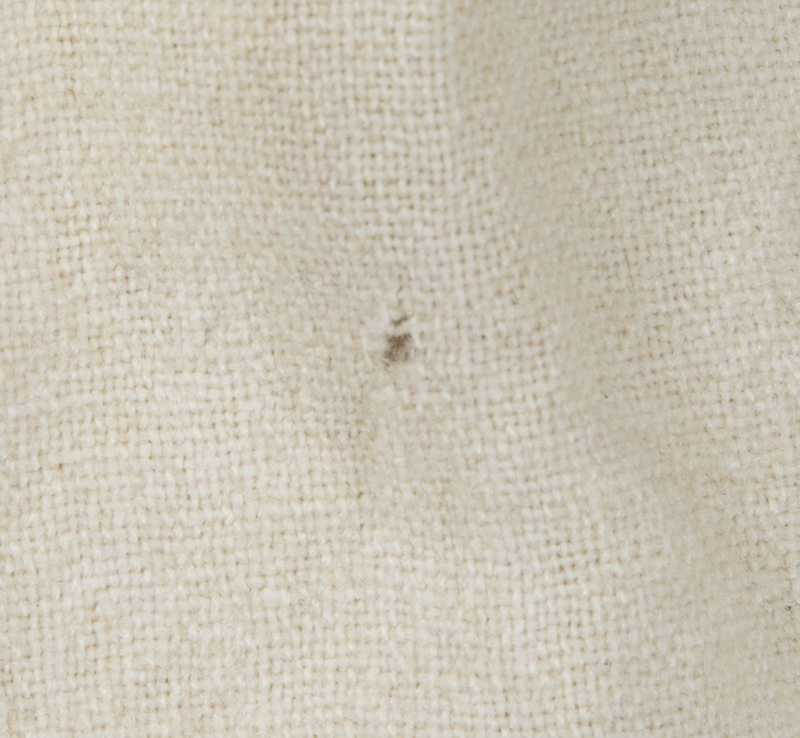 This jersey shows solid game use. 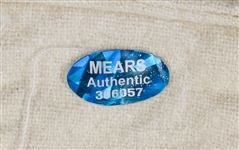 A jersey of this magnitude cannot be overstated. Previously, Jackie's 1947 Brooklyn Dodgers rookie season home jersey sold for $2,600,000 in April of 2018. 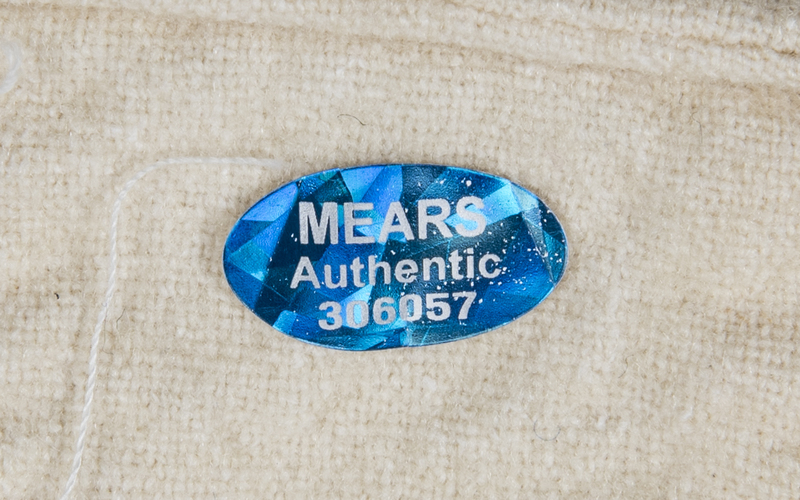 This jersey originates from one of his statistically best seasons of his Hall of Fame career and it comes fully authenticated by MEARS for the game use by Robinson and have graded this jersey a solid A8. 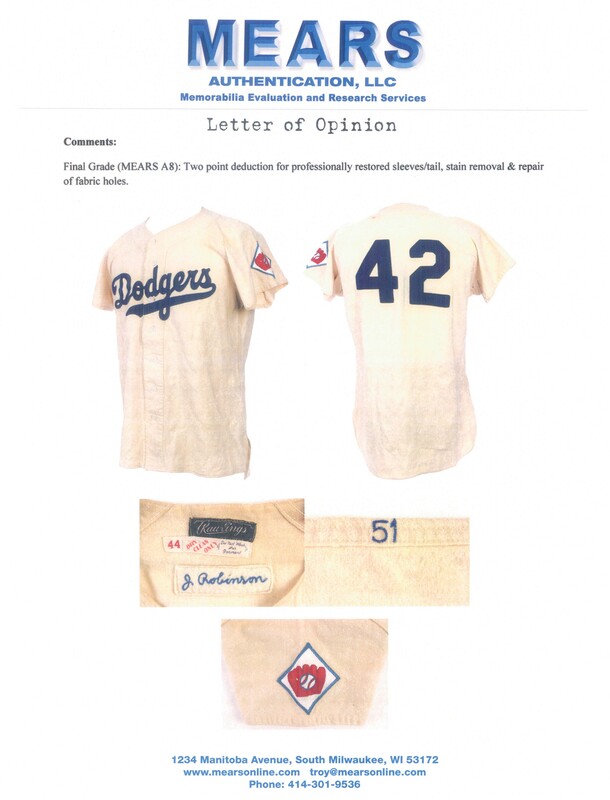 This is an item that every museum in the country would want to display and The Jackie Robinson Museum has expressed interest in displaying this jersey should the winning bidder choose to place it on loan. 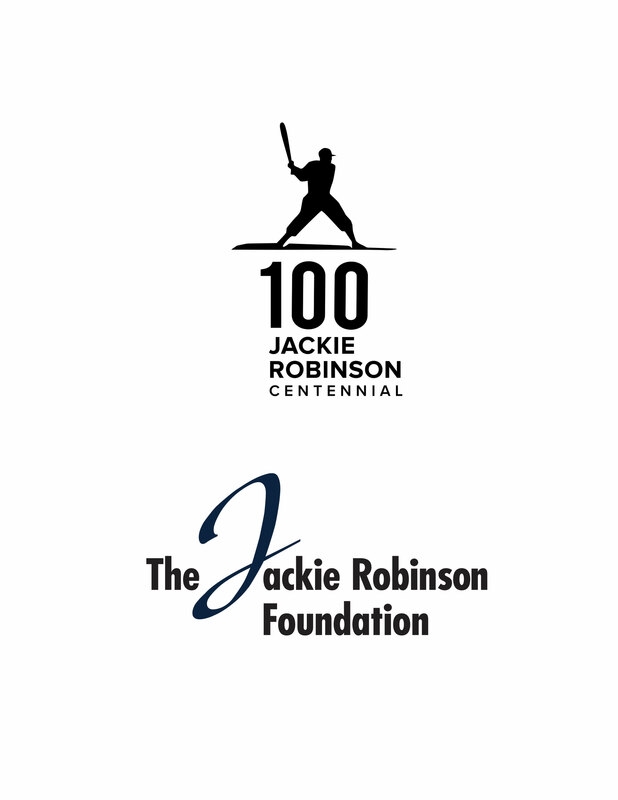 Please note that this lot has a 25% Buyer’s Premium (28% if payment is made using a credit card and/or is not paid within 10 days of invoice) as it is part of the Jackie Robinson Foundation Auction with a portion of the winning bid going to The Jackie Robinson Foundation.